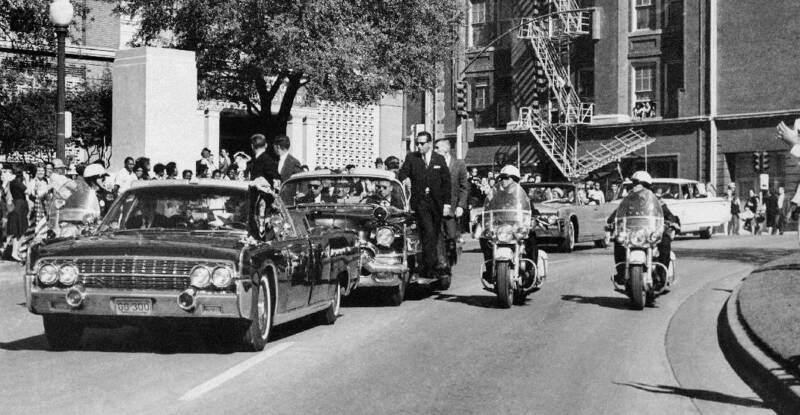 In this Friday, Nov. 22, 1963, photo, seen through the foreground convertible's windshield, President John F. Kennedy's hand reaches toward his head within seconds of being fatally shot as first lady Jacqueline Kennedy holds his forearm as the motorcade proceeds along Elm Street past the Texas School Book Depository in Dallas. Gov. John Connally was also shot. President John F. Kennedy is slumped down in the back seat of this car immediately after being shot in Dallas on Nov. 22, 1963. Jacqueline Kennedy leans over the president at right as a Secret Service agent stands on the bumper at left. Jim Hall looks back on the 55 years since President John F. Kennedy was assassinated in Dallas and wonders if the country has ever been the same. Hall, a well-known Signal Mountain resident, lawyer and veteran of the Vietnam War, was the chairman of the National Transportation and Safety Board for seven years, from 1994 to 2001. Prior to that, he worked in the cabinet of Tennessee Gov. Ned McWherter and as chief of staff for Democratic Sen. Harlan Matthews. Hall served on the University of Tennessee Board of Trustees and on the board of the University of Chattanooga Foundation at University of Tennessee at Chattanooga. Hall was 21 years old and in class at the University of Tennessee at Knoxville when President John F. Kennedy was killed on Nov. 22, 1963. As he walked to his car in a parking lot behind the administration building, he heard the president had been shot. By the time Hall got to a fraternity house with a television, Kennedy at been pronounced dead. "I think it was the first, internal shattering moment in the United States," said Hall. "Everything had been about the end of the Korean war and other foreign relations issues. All of a sudden, everyone became uneasy. "The country was in shock for a period of time, and some would say that the shock has never ended. We seem to have gone from one violent event to another. The stability the country felt after the war and under Eisenhower ended that day." Here's how Chattanooga's two newspapers reported the JFK assassination. Chattanoogans woke up on the Friday before Thanksgiving in 1963 to partly cloudy skies and the promise of at 70-degree winter day, according to the morning Chattanooga Daily Times. The 30-page, eight-column newspaper cost 7 cents, had a page dedicated to "Society and Clubs" and contained obituaries that included the specific time of death in many cases. There were 11 stories on the front page, nine of them national or international. One local story involved two witnesses in a "sweeping" investigation of professional gambling by a Hamilton County grand jury going to jail for the night rather than answer questions. The second local story on A1 was headlined, "7 Cage Games Today." At the top of the page was a story showing President John F. Kennedy working a crowd that turned out to see him in San Antonio. "President Tells Texans Space Program Valuable" read the headline above a report about the president, gearing up for a re-election campaign in 1964, beginning a multi-city tour of Texas. The report said Kennedy was lobbying for the space program, which had just had its budget cut by Congress. Six years later, America would land a man on the moon. Just hours after Chattanoogans read the story — at 11:30 a.m. EST — President Kennedy would be assassinated. The paper's editors released the paper to the printing press before Kennedy was officially pronounced dead at noon in Chattanooga. The newspaper used a nine-word bulletin from the Associated Press that said "sources" had confirmed Kennedy was dead. The last time reference in the fuller story from United Press International was the president being taken into the emergency room at Parkland Hospital, which occurred at 11:36 a.m. in Chattanooga. The report said, "the President, his limp body cradled in the arms of his wife," was lifted out of "the famous bubbletop" limousine at Parkland. The story quoted Secret Service Agent Clint Hill saying, "He's dead." Hill was the Secret Service agent who first climbed onto the presidential limousine to shield the fallen president and First Lady Jacqueline Kennedy, which produced one of the most iconic news photographs from the 1963 assassination. There was no photography available to News-Free Press editors in the newsroom on 11th Street. Instead, the paper used an oversized headshot of a smiling Kennedy above the content from the two news wire services. Two, three-column pictures of Kennedy from the previous day in Houston and Fort Worth, where the president spent Thursday night, were underneath the banner headline. The newspaper editors made the decision to retain a story on A1 previewing the speech Kennedy was to give that Friday in Dallas, including direct quotations from the prepared text. The report carried an editor's note explaining that the news report contained what Kennedy was "scheduled" to give. The rest of the front page contained two stories centering around events marking the 100th anniversary of "civil war action on Missionary Ridge" and updated the morning story from the Daily Times about the men who went to jail for refusing to talk about a local gambling operation. One had been freed and the headline said the man was told "to see" the grand jury. The first local reaction to Kennedy's assassination in the newspaper came on Saturday morning. The story said "shocked shoppers downtown Friday afternoon could not grasp for some time the awful fact, but many were soon standing in dazed groups around radio or television sets in the stores, saying little, buying less. Stores were not closing, but one clerk commented, 'We might as well – no one's interested right now in shopping." The story went on to say students in Chattanooga schools were notified over the intercom, and that "many teachers reported that scores of children sobbed."